Translated from German: "Good folk always prizes itself in stark arrangements. The use of few instruments leave the songs and the dense, often sad stories room to breathe. This is the case with the third recording of the English singer Holly D Johnston. She accompanies herself on the acoustic guitar or at the piano. In 'Frida', (about the painter Frida Kahlo), viola and cello are added. When further colours - as in 'James Watt 1812'; Pennywhistle, Flute and Organ, or in Black Crow Mandolin and Cello - join in, the soundscape moves more in the direction of Loreena McKennitt, looking for much stronger Celtic motifs and passionate singing. This is how the sensitive melancholic folk tunes are made memorable. Turning Circles'; or 'Is This Love'; evoke Eva Cassidy or Judy Collins. The historically interested Johnston also reminds us of important social contributions by women in 'Women of History'; Tick Tock Da Vinci'; without sounding complaining, and 'Skipping Stones'; with Djembe slightly African. At the end the drums sneak into 'Basket'. 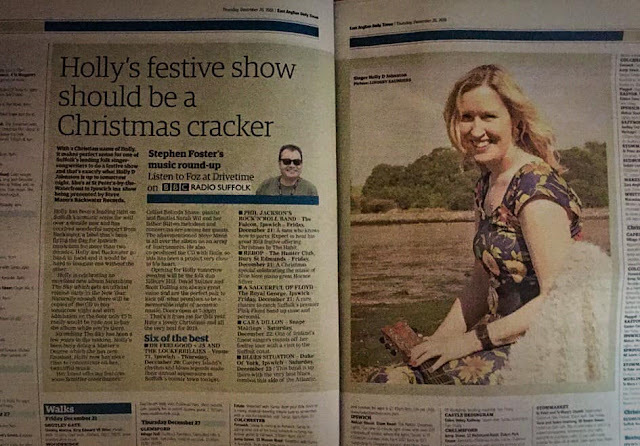 With Thanks to the East Anglian and Stephen Foster for announcing the album launch so spectacularly! ’Elementary,’ the album opener is clever just like its subject matter on Sherlock Holmes pursuing his foes through the streets of London – “the game’s afoot” – while ‘Perfectly Strange’ is based on another Victorian novel, this time ‘Alice’s Adventures in Wonderland.’ And the songs aren’t all related to literary endeavours either – allied to smart lyrical wordplay – although there’s plenty of that on show. ‘All for Mexico,’ for instance, is about Jose Morelos, the Mexican Roman Catholic priest and revolutionary rebel leader who led the Mexican War of Independence movement, while ‘Dear Diary’ is a meditation on the sort of letter you might write to your younger self given half a chance. In terms of their sound, Holly Johnstone has a pure, pristine sounding vocal, while she’s ably assisted throughout by Jonathan Coy on acoustic guitar. That’s the full extent of any instrumentation on the ten songs – and you also feel that Holly could benefit from singing in a lower register at times in order to sustain the listener’s interest – but a decent effort nonetheless. Recently listened to an extension to the ‘man with guitar’ concept, that’s ‘man with guitar plus voice’ - and that's an appealing and eminently listenable voice. 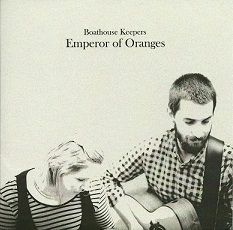 In this case Suffolk acoustic duo Boathouse Keepers and their debut album ‘Emperor of Oranges’. Singer songwriter Holly Johnston, she of that individual voice and guitarist Jonathan Coy, who clearly knows his way around his instrument, are Boathouse Keepers, and a fine debut they have produced. ‘Emperor of Oranges is a collection of narratives, personal, historical and observational, and all worth taking time to know. There’s little doubt about the quality of Holly's voice or Jonathan's ability on guitar, the only criticism is the vocals are mixed so far back sometimes the lyrics become lost and that’s a shame. And turning up the volume is not the answer - this is not an album to have on full volume, this needs to be listened to with time and space to reflect. Opening with ‘Elementary’ and including beautifully crafted songs like‘Nobody’s Fool’, ‘Dear Diary’, ‘Safe Inside These Walls’ and the title track ‘Emperor of Oranges’ this is a solid debut. 5.0 out of 5 starsA beautiful album. East Anglian Girl. I must confess, the album ‘East Anglian Girl’ is the first I’ve heard of Holly Johnston, and I cannot imagine why. With her obvious gift for writing profoundly individual, emotional songs and delivering them through pure, passionate, expressive vocals it is frankly unthinkable that Holly could keep that talent hidden away. Apparently, Holly released a debut album over ten years ago, which gained considerable recognition – no surprises there. Then she left her audience waiting for the follow up – probably in disbelief that such a travesty could occur. Never mind, for those that know her work there’s the delicious anticipation for the release of ‘East Anglian Girl’ in January 2014, and for those that don’t a significant treat awaits. Possessing an instant attraction, ‘Read me A Story’ opens the album and tells its achingly elemental human story, with unerring accuracy. The sweetly painful, mortal truth that Holly puts into her songs makes them striking - messages of experience, memories shared and hauntingly exact observations – one person sharing incidents and encounters that touch everyone. Listen to ‘Maybe You Would Be’ and ‘Watch Them Fall’ or the simple cello and piano delicacy of ‘Just Like That’ and you’ll hear what precisely I mean. There’s more desperately tender beauty in ‘Calling Her’, coming close to being my favourite track. Then again, there’s the poetic candour and pain of ‘Sorry John’ that cuts like a knife. Needing an exceptional voice to deliver its soul touching narrative while avoiding mawkishness – Holly quite simply nails this song to perfection. Musicians playing on ‘East Anglian Girl’ are Holly Johnston (vocals, acoustic guitar, piano, organ) with Florian Sauvaire (drums) Chris Lockington (electric and acoustic guitars) Steve Mann (bass, mandolin, 12-string and acoustic guitars, organ, electric piano) Mike Summers (drums, Cajon drum) Belinda Shave (cello) Alex Richardson (violin). ‘East Anglian Girl’ releases on Backwater Records on 6 January 2014. Believe me, it takes a lot to move an old cynic, yet this album moved me. So after the festive season excesses take my advice, start the New Year off with a special treat, buy this album. According to the press release it has been nine years since Holly’s debut album and single, and just can’t imagine why it has taken so long if the debut is anything like this. Mind you, the other burning question has to be why on earth I didn’t get to hear the first one all those years ago as this is a sheer delight from start to finish. It took me a long time to work out who she reminded me of, but in the end I realized that I was having the same reaction to this as I was the first time I came across Eva Cassidy, yes her voice is that good. The album straddles folk and acoustic music quite happily, and she has chosen her musical colleagues well as they do just enough to provide a good accompaniment without ever overpowering the wistful whimsy of her voice. 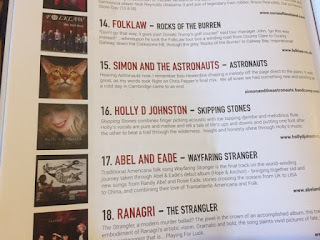 Holly switches between acoustic guitar and piano, and there is a pop mentality in what she is doing, so I can see her crossing over into a wider audience of people who enjoy Judie Tzuke and Lucy Silvas. But, there are also those folk purists who are going to get a great deal from this album, as she knows exactly how to make simplicity seem multi-faceted and layered. A beautiful album in so many ways – let’s hope she doesn’t take another 9 years to make the next one. 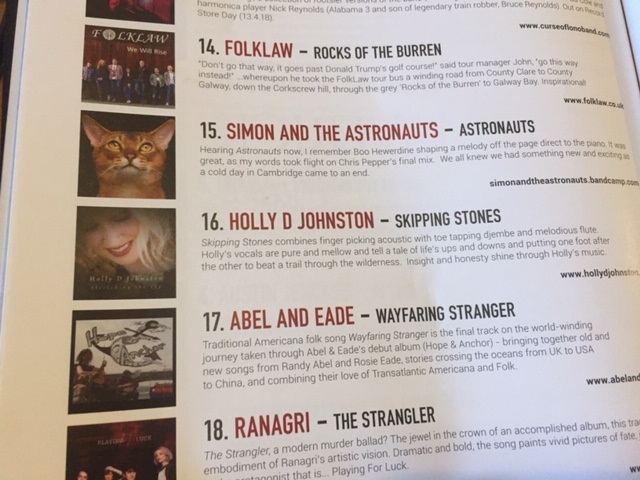 For those of us who are long standing fans of Suffolk’s singer songwriter Holly Johnston, it has been a long wait; her last album release was nine years ago and recorded when she was a teenager. Therefore it was with some sense of anticipation that we headed to the Cult Café on Ipswich Waterfront to hear her perform songs from the new album, East Anglian Girl out on Backwater Records, Steve Mann’s estimable Ipswich-based label. In a varied programme Holly performed with a six-piece band, a trio, in a duo with her father Bill, which featured folk tunes remembered from her childhood. Most memorable of all however, was a solo spot in which Holly accompanied herself on guitar or piano, which provided some of the most intense moments of the evening. Holly’s new songs are emotional yet straightforwardly-narrated and in some cases, very moving. They show the maturity you would have expected to witness in the intervening years since her last recordings. Her voice has also developed into a wonderful instrument; mellow, clear and expressive with that rare combination of folk and soul. Stand out moments of the evening were the hauntingly sad ‘Sorry John’ and by contrast, East Anglian Boy which, performed with the whole band, had power and a strong melody. The only real disappointment was the inappropriateness of the venue; the Cult Café is to be congratulated for its new programme of folky Americana over the next few weeks (check out the programme at www.cultcafe.co.uk) and lord knows, we need more venues for this music in Ipswich. However, the place was filled with a mixture of people – some of whom were clearly there for the music and some for a noisy night out. Holly coped well with the pretty constant backdrop of talking and is to be congratulated for her uncompromising commitment to including some of her quietest songs. Holly’s musicians were sensitive accompanists and especially in the last set of songs, played with confidence and generated plenty light and shade. It is a tribute to Holly, her songs and her band that there was such an ovation at the end. If there were any justice in the music business today (big if!) Holly would be playing in venues with acoustics which would do justice to her voice. The album is highly recommended and repays repeated listening. Holly Johnston is a Suffolk born and bred singer-songwriter who finds her roots in contemporary folk-pop music. For those of you who recognise the name, Holly's debut album and single some nine years ago left listeners eager for her follow-up recordings. After a long wait Holly's second album East Anglian Girl is finally released this month. You will certainly hear some of the twists and turns from the last decade in her songs and once again be lulled by Holly's beautiful pure voice. Holly is indeed an East Anglian Girl whose songs tell stories of everyday life that her listeners will be able to identify with. She sings in a clear voice which allows her to carry the emotion of the lyrics, and accompanies herself faultlessly on guitar and piano. On this album Holly has gone for a big production job without losing sight of her acoustic roots. The opener Read me a Story is backed by electric guitar, bass and drums, a combination which certainly makes you sit up and listen. This theme is carried on through the next two tracks Maybe you would be and Watch them Fall, then taken right down with an acoustic arrangement of Just like that with Holly's piano and Belinda Shave's orchestrally arranged cello. The album is a good mix of band arrangements and more acoustic performances. Waterlillies is given the pop treatment whereas Sorry John is simply Holly and her piano. My favourites are the quieter songs as Holly's voice sometimes gets lost in the big band mix. East Anglian Boy and Dancing Around are the particular highlights for me. At the end of the album there is a Track 12, although only 11 are printed on the sleeve. A bonus.